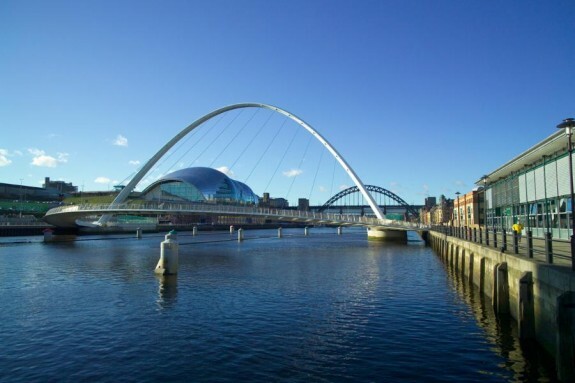 Newcastle-on-Tyne- the capital of the north? 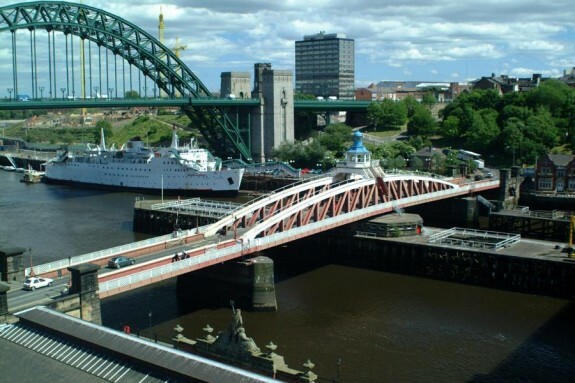 I’ve never heard Newcastle-on-Tyne described as a city of bridges, but it very well could be. There are six of them spanning the River Tyne, some of which would be recognised around the world. When I grew up “The fog on the Tyne” was a popular folk song, always accompanied by the image of the Tyne Bridge, built in 1925. Newcastle today is a thriving metropolis. 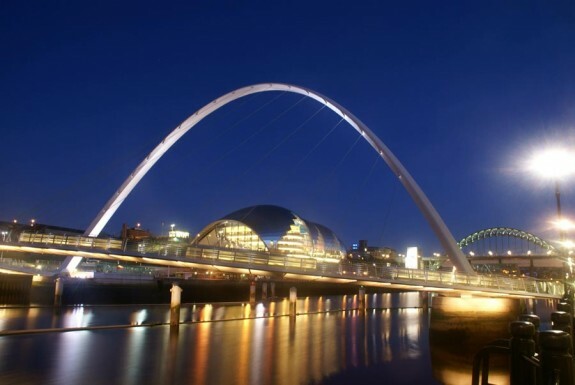 This dynamic modern city has a heritage spanning 2,000 years, as well as the River Tyne. The first bridge here was built by the Romans in the position where the Swing Bridge stands today. It was then guarded by a fort on Hadrian’s Wall and named Pons Aelius. When the Normans came along they were swift to recognise a good strategic situation, and the wooden fort they erected became “New Castle” in 1080. It was later replaced with stone and the Keep today is one of the first sights you see as you approach Newcastle by rail. A substantial part of the city walls, built in the 13th and 14th century, are still visible today, but they are not what brings people to Newcastle. 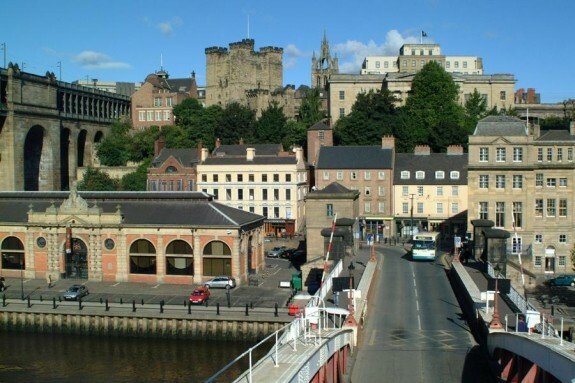 Todays Newcastle is a mecca for shopping and entertainment and a thriving university city. The Eldon Square shopping complex continues to grow and develop, and innovative design is everywhere. Department stores like John Lewis, Fenwicks and Debenhams thrive in the bustling atmosphere which is year round. All of the high street names are here, with space for the smaller boutiques which keep fashion alive. 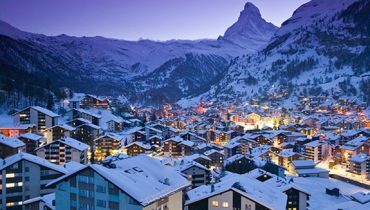 Prices are keenly competitive in this environment, with students always on the lookout for a bargain. Newcastle has also taken it upon itself to champion the Arts. Former warehouse the Baltic Centre was the venue for the Turner Prize exhibition in 2011, the first time it had ever been held outside of London and resulted in record numbers flooding through the doors. Scottish sculptor Martin Boyce was the proud winner. 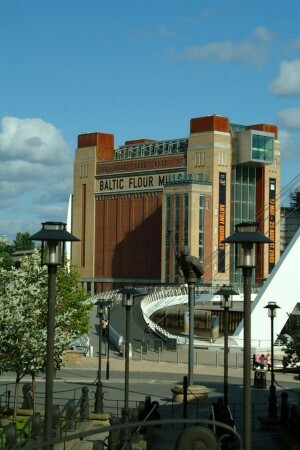 Iconic buildings line the shores of the River Tyne, best known and loved, the Sage Theatre. Whether you’re a fan of Michael Flatley’s Riverdance, Jazz festivals or Northern Synphonia orchestra, the Sage has it all, with world-class acoustics. 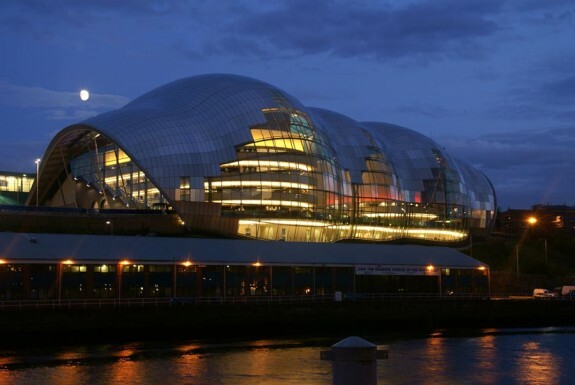 http://thesagegateshead.org/ . As with the Baltic Centre, the Sage is on the Gateshead side of the Tyne, but this simply provides an opportunity to cross over one of those bridges. If popular music or theatre are your idea of entertainment there are no shortage of venues in Newcastle- Metroradio Arena, O2 Academy, Theatre Royal, City Hall, are just the tip of the iceberg. Similarly you can eat at every level from Michelin starred cuisine to Gregg’s pasties! The only limit is what you can afford. If any city ever made the best of its riverfont, then Newcastle has to be a front runner. A broad walkway runs beside the Tyne, backed by bars and restaurants like Pitcher and Piano, hotels and executive apartments. Many of the hotels have a restaurant window looking out on the river and sometimes a seating area outside for those pleasant Summer days. The Baltic Centre has a ground level cafe where you can have a light lunch in prime position for the opening of the Millenium Bridge, or celebrated rooftop restaurant Six for stunning views. The cheerful little yellow buses hum up and down from the Quayside to the shopping centre every 10 minutes. Take advantage of these as it’s a bit of a climb back up. The High Level Bridge was designed by Robert Stephenson and was the first road and rail bridge in the world. The railway is carried above and the road below. The most exciting of Newcastle’s bridges is of course the newcomer. Gateshead Millenium Bridge, or The Eye as it is fondly known, was the first opening bridge to be built across the Tyne in 100 years. It is a pedestrian and cyclist tilt bridge. Opened in September 2001, it rotates to allow small ships to pass beneath, taking approximately 4.5 minutes to fully open, depending on wind speed. It is an inspiring sight. In general it opens at 12pm daily, but this is always subject to change. So that’s Newcastle in a nutshell, but it doesn’t end there. 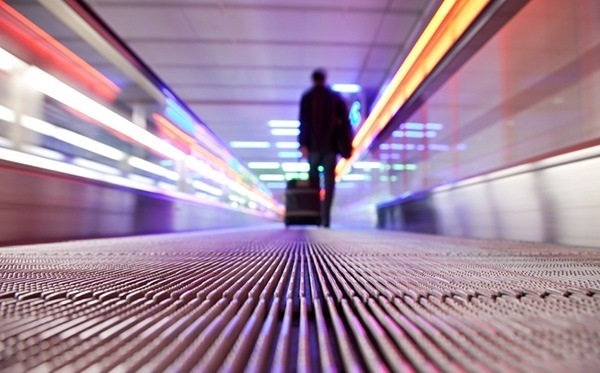 If you can’t get enough of shopping, Gateshead Metro Centre is the UKs largest shopping and leisure centre, an easy 3miles away by bus or train. The coast of Northumberland stretches north of Newcastle, with miles of pristine golden beaches, fishing villages and castle ruins. And then there’s Hadrian’s Wall, in beautiful countryside, with Roman Forts like Vinolanda, Housesteads and Chesters Walled Fort to explore. 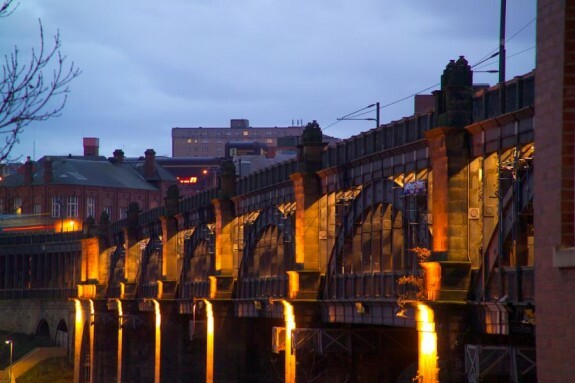 Whether you have just a few days, or a week or more, you will find plenty to see and do in this city, which is truly justified in calling itself “the capital of the north”. I currently live in the North-East of England but have a home in the Algarve and have travelled extensively throughout Europe. I have Polish family and love visiting them, but I'm happy travelling anywhere. web as compared to books, as I found this article at this site.